This all year round Vaudeville tribute to sing-a-longs from the War Years is an show with a difference! It can be a bit cheeky! Keeping alive important songs: VERA LYNNS ‘We’ll Meet Again’ & ‘White Cliffs of Dover’ along with ‘Lili Marlene’, ‘Pack up Your Troubles’ and ‘Bless ‘em All’. 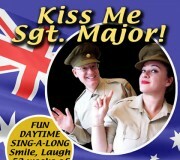 A rich, fun filled show of sing-a-longs and wonderful humour – you will enjoy Kiss Me Sgt. Major!